Colorado Software Development Studio specializing in Multimedia and Video Game Development. Denver game development continues to heat up this summer with many Denver indie video game companies joining us at the 2014 Denver ComicCon. Back when Denver ComicCon was just an idea, we didn’t imagine it would become this big so quick. We are fortunate to have the opportunity to contribute each year and always look forward to this event. If you are interested in Denver video game development and can’t make it to this year’s Denver ComicCon, be sure to stop by a Colorado IGDA event. The Colorado Chapter of International Game Developers Association is one of the longest-running formal gathering of game developers in the U.S. We still meet the first MON or TUE of each month and have special events every year like the Denver Video Games BBQ, Colorado Game Developers Holiday Party, and Denver Indie Game Expo. Interested in XboxOne, Playstation4, PC or mobile development? Come out to a meeting. It is free to attend. For more details on these and other events you can just google: Denver Video Games and hit the first link to BAP GAMING. Also, you can now follow us on Twitter and Facebook or join our Email List and we try and keep that updated with all the best gaming events. 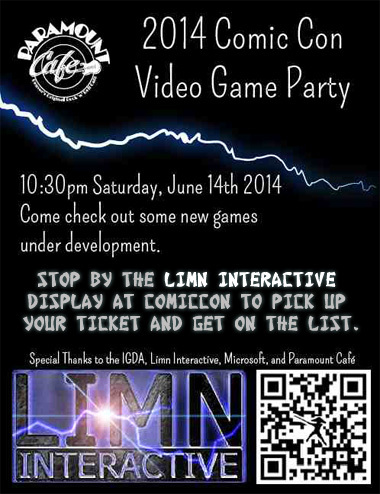 The 2014 Denver ComicCon Video Game Party will be June 14th, 2014 10:30pm at The Paramount Cafe – Denver. Stop by The LIMN INTERACTIVE display in the video game section of Denver ComicCon to get on the list and pick up your tickets. Also be sure to sign up for the ZenPathz tournament and other Denver eSports tournaments. Arrive early for the 2014 Video Games and Colorado Game Developers Panel at Denver ComicCon scheduled for Sunday morning. There will be previews of new games in development and more surprises this year with the new platforms and great games arriving. More Q&A this year, console, PC, indie, and mobile.